Shearing and forming processes are combined with what is known as metal stamping. Stamping is the act of pressworking sheet metal to change its shape either with or without accompanying shearing or punching. Each metal stamping or fabricating project has its own techniques and design considerations, and each project can benefit from innovative ideas that produce more efficient, higher-quality parts. It's important to note, however, that in stamping there is no final machining away of metal. Instead, the scrap areas of a part are removed in the initial operations and a piece is created from this blank. The elimination of this additional operation reduces manufacturing costs. Parts made as metal stampings can be found in nearly every industry and everywhere you look in daily life. Stamped parts can serve many functions from holding, joining and aligning simple shims and plates to enhancing the safety, design and critical part stiffness of highly engineered parts used for complex enclosures and mechanical brackets. The application of these parts is only limited by the imagination of the designer or engineer creating them. Whether you should choose short-run or long-run stamping depends on your exact application. If your project requires millions of identical parts with several complex operations to form, then long-run stamping is likely the most economical option as the price-per-part will be lower. However, short-run stamping can substantially save you both money and time. Savings are generated from short-run stamping's extremely low initial tooling costs, which, in most instances, saves approximately 80% compared to conventional permanent dies. Additional savings are generated each time you change die design of an item, as the tooling can be altered for a small fraction of the original charge. Short-run stamping also allows you to get small quantities of stampings delivered quickly – which enables you to maintain very low inventories and, in turn, see additional savings. 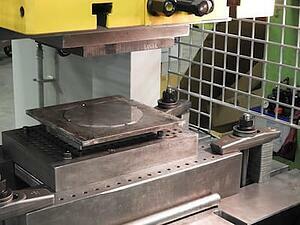 Time is saved because tooling can be made in a fraction of the time it takes to design permanent dies. As a result, finished stampings can be produced quickly. While short-run stamping can generate savings when quoting and ordering parts, there are many design decisions that can further reduce stamping costs. More than any other single factor, the specifications in an engineered drawing will determine the price you will be quoted for a part. This is why it's imperative to carefully consider the ways in which your specifications will affect the price you'll be quoted. Don’t include excessive tolerances, limitations or any other specification that is not required by the design. For example, it can be common practice for some companies to mark all prints with a tolerance of plus or minus 0.001" for all dimensions. This makes it mandatory to hold that tolerance on all dimensions and, in return, it may make it necessary to carefully inspect 100% of the pieces. This will cost you extra money when you may only need one of those dimensions to be at plus or minus 0.0001". Similarly, making material specifications without thinking through the requirements of your part can lead to selecting materials that are difficult to obtain – which will determine whether you receive a reasonable quotation. This type of careful consideration should be applied to design requirements, finishing methods, quality assurance and every other step in the manufacturing process, or else you, the customer, will be footing an unnecessarily high bill. Luckily, manufacturers are frequently looking for ways to increase efficiency and decrease costs. It's always worth discussing your job and how your part will be used with your metal stamping supplier since they know the operations and shortcuts that will lead to the most economical production methods. In future posts, we'll discuss many of the design considerations you should make to ensure you're getting the precise metal stampings you need at the best price. We'll also provide relevant examples of real-world applications. If you're searching for a metal stamper or have questions about what we do, read about our precision metal stamping services or get started on your project right now by submitting a RapidQuote.